Woke up to two happy boys today. I swear you can feel their relief at finally having a family. It’s the same thing for breakfast every morning (which is actually pretty good, but after the 5th day it’s getting old) :-). Tomas didn’t like it the first day, so you can imagine his delight on the 3rd. 🙂 He decided to ask the waiter for some injera, which they obviously don’t serve for breakfast. So he choked down a bit. When we dismissed the boys and they walked by the buffet line they both did this little hand wave. I asked Mesfin later what the hand wave meant, “It means ‘I hate you’ or ‘I don’t like it’”. Thankfully we have yet to witness that little wave towards us! We played for just a bit because at 10 it was off next door where we had the goodbye ceremony. We actually have a pastor in our travel group so Sister Martha (the head nurse at the care center) asked him to say a few words. He read from the Bible and did a mini sermon. It was terrific, and perfect. He thanked the entire staff on our behalf for taking such good care of our kids. Nathan (the pastor) made sure to emphasize the fact that, yes, God did ask us to take care of the widow and the orphan, but in so doing, God has blessed us beyond measure. Too many people concentrate on only one half of the equation and forget completely the other half. Truly, being able to mommy these babies is one of the greatest blessings of my life. One of my favorite parts of the ceremony was when Sister Martha asked someone to sing an American good bye song. Since our travel group knows Zach is a director of a camp they offered him. We all wanted to hear an Ethiopian good bye song but she insisted. So, you guessed it, we sang Kum-bah-ya. I insisted he explain what it means, because it really was fitting for the occasion. In case you weren’t aware, it means “Come by me” so when you sing it you’re asking God to come with you in everything you do. Anyway, what was really cool was that the Ethiopians knew the song and one of them had even heard it when she visited Nairobi. Tomas and Bini glowed when their daddy led them in song. Oh, and it was also cool because to start the ceremony off they had the kids from the center sing a song and do you know who led that? Yup, Tomas. His voice is heaven sent I tell you. The boys were very interesting at the care center. Tomas’ chest puffed out and he walked around demanding things from everyone. This is a stark contrast to the Tomas we see in the hotel. This outgoing, sweet boy who likes to wrestle and likes to give kisses turns into someone who is, as we say “too cool for school”. Binyam, on the other hand, completely regressed into himself. He said something to Mesfin so when I asked him what he said, Mesfin replied, “Binyam said he is done with this place, he wants to go back to the hotel with his mom and dad”. Though this made me feel really good I felt awful that he was there again in the first place. Binyam walked around for most of those few hours in an obvious haze. The hardest part was leaving them there. This is my one negative comment about the week. We had the goodbye ceremony and then we were supposed to go shopping, well we are not allowed to take the kids out very far so…you guessed it, we had to leave the kids at the center for lunch/naps. Tomas was ok, he still is not real attached to us (how could he be, it’s been just a week) and he’s seen this happen many times. Binyam, on the other hand, is already forming bonds with us and as soon as I handed him off to his nanny was screaming and reaching for us. Ugh. Took everything in me not to just take him back. But I knew once we came back that they’d be able to see we’ll always come back for them so I swallowed the lump in my throat and forced myself to shop. 🙂 We got lots of good things that we hadn’t gotten last time, including a traditional coffee ceremony set. So I was thrilled. When we got back to the hotel we decided we would have the ladies go get the kiddos and the men go get pizza from a golf club down the road a bit. We were all kind of sick of the food from the hotel as it is the same menu every time and after a week we needed a change of pace. 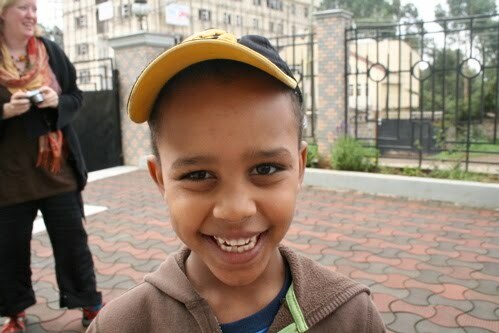 When I walked up the steps of the center Binyam opened the front door and hurled himself at me. “Mommy!” The best feeling, the best feeling. Tomas even looked excited to see me and came out on his own fruition, without the nannies telling him to! Zach had heard me scream “Bini” so he came over to say hello before getting the pizza. Tonya (she and her husband, Kevin, have become friends of ours as they have 3 kids at home and are picking up 2 siblings, and are just terrifically cool) 🙂 and I headed back to the hotel to wait for the men to bring back the pizzas…almost 2 hours later (!) they were back. Had lots to do with Zach and Kevin not knowing where they were going, let me just say that. But those few hours in the hotel were some of the hardest here. Lots of reasons, but I’ll just say sometimes it’s hard to parent kids from other cultures who speak a different language when there are people from that same culture who speak the same language around. 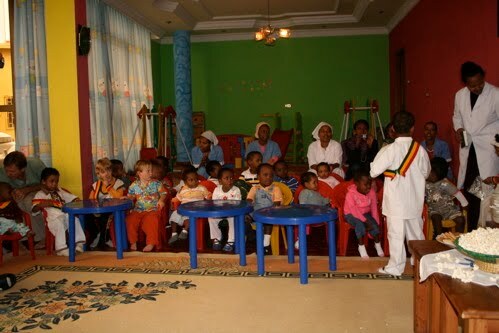 What I love about Ethiopians is how much they care for all of the kids. The women cooking were just bringing the kids back with them and having them sit on their laps. This is great, and I typically don’t have a problem with it because soon enough they’ll be in America, but last night was just more difficult for various reasons. Needless to say, we were all happy to see daddy with pizza boxes! Zach and I shared a bottle of wine and then headed to bed, to what would be our very last night in Ethiopia. My prayers were mostly about the boys I was laying next to, the kids we are so excited to see home and a non-turbulent airplane ride. Today (Thursday) we decided to have some oatmeal I brought instead. It was a great idea, it gave a little change up to the menu. Then Tonya and I hired our driver Tsegaw to take us to the Holt offices to drop some of Tonya’s donations off and then back to the shopping center. I wanted an injera basket and hadn’t gotten one yet (and apparently I needed 3 more scarves?!?!?!?!?) and she wanted a coffee ceremony set. It was a lot of fun, and made the morning go a bit faster. When we got back we headed to the golf club as a family, since Holt said we could go that far with the kids. Bini insisted on walking the whole way so it took us awhile but it was worth it! The food was AMAZING and it was actually cheaper than our hotel. ($20 for 4 meals, 5 drinks). It was so much fun just hanging with our family and Kevin and Tonya and girls. Tomas entertained us by teaching us Amharic. We would point to something and say, for instance, “In America, this is called ‘glass’, in Ethiopia?” And he would tell us what it’s called in Ethiopia. It was an awesome game. This kid is wicked smart. A nice walk on the way back as it started to get a bit warmer (it’s still cold here in ET, every day I’m wearing either jeans or a sweatshirt or both) and wasn’t raining. Now in the hotel room the boys are napping peacefully, Zach is reading and I’m blogging. Sounds like a great time to me! Few more things on the boys: Tomas talks in his sleep! So precious. 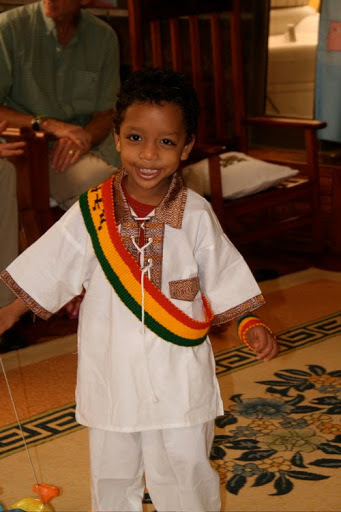 I hadn’t heard an Amharic night talker before but I gotta say it’s too cute…and loud! Binyam “Bini” or “Bini Boy” as I call him, has a huge stye on one of his eyes, looks so painful. But his smile, ohmygoodness, it’s so big it even pulls that swollen eye all the way up! In a few hours Zach will head to the Holt office to pick up our Visa packets for the boys. A quick dinner and then we’re off to the airport. We take off at 10:50pm Ethiopia time which is 2:50pm CST. Please, please pray for safe flights that are on time and the reunion for the whole family. We are so very thankful for another great week in Ethiopia and two more angels to add to our brood. Thanks for hanging in. “Talk” to you in America!!!! I'm sooo ready to meet these boys! Prayers for safe travels all day and tomorrow! Xoxo. I love, love, love all these detailed updates you've done. I can't WAIT till I am over there to get my son and experience this beautiful country. Your boys are beautiful. Congratulations, and I'm praying for your flight back! Safe travels my friends! I can't wait to see your whole family together! Every picture of Tomas has freaked me out because he looks SO much like Tariku! By now, you're already up in the air, so I'll be praying for a safe landing. It is 10pm in Iowa and you are on your way. We are all looking forward to seeing you and meeting our new grandsons. Love You All!! I think you may be home. I am calling tomorrow. Hopefully soup by the end of this weekend. Love, love to you and your family.